I studied handwriting comparison for a diploma in 1972 in Scientific Crime Detection (see Forensic Trainee) and had much other tutelage (see "Forger") and self-training. I also completed a course in Expert Witness Testimony at Eastern Kentucky University in the Spring of 1991. 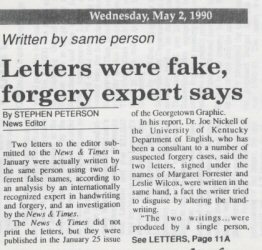 As a Historical Document Consultant (q.v), I have made many handwriting comparisons, and I am author of Pen, Ink, and Evidence (1990) and Detecting Forgery (1996), as well as co-author of Crime Science (1999). 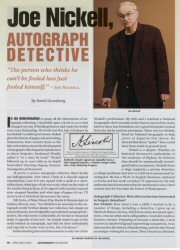 I was profiled as an "Autograph Detective" in the April/May 2007 Autograph Collector.